Sydney Theatre Company (STC) and Qantas present WAITING FOR GODOT by Samuel Beckett at the Sydney Theatre, Hickson Rd. Walsh Bay. WAITING FOR GODOT by Samuel Beckett is regarded as one of the most important plays of the last century. What impressed me most was the deadpan humour, the self-doubt, the self deprecation layered on a bed of rock-hard erudition, worn gossamer light. At the same time from book to book there was a successful stripping away of the extraneous: what had sometimes glittered but cluttered in MURPHY had virtually disappeared in MOLLOY and MALONE. The movement seemed inexorably toward minimalism, perhaps ultimately towards silence. ...Is it possible for Mr Beckett to progress further without succumbing to the incomplete incoherence of inarticulate sound, to the silence of nothingness where mud and Molloy, where object and being, are not only contiguous but one? Mr Beckett's next book, announced for publication early this winter, will have to reply. Perhaps the name is significant. It is called L'INNOMMABLE - THE UNNAMABLE. (1). ... posters on the Left Bank announced that a play by Samuel Beckett, EN ATTENDANT GODOT ... was scheduled to open in early January (the 5th of January,1953) at the Theatre de Babylone ... Roger Blin directed the production and played Pozzo (which Beckett had written with him in mind.) .. So I went alone, and when I say alone, I am close to literal, for there could not have been more than a dozen souls in the audience. As the play progressed, I realised I was in the presence of something special, the likes of which I had never read or witnessed. And that included the plays of two other playwrights fresh on the scene of the Paris theatre, the Romanian Eugene Ionesco (LES CHAISES, LA LECON) and, a Russian, Arthur Adamov (LA GRANDE ET LA PETITE MANOEUVRE), both of whom, like Beckett, were writing in French. ... Two or three weeks later I invited a friend (his future wife Jeannette) to see the play with me. That night the audience had more than doubled, a good sign, but scarcely enough ... Thirty-some, if memory serves. At the curtain, the applause was scattered, hesitant at best. When the lights came up, half the audience had already left, and several of the remaining heads were shaking, either in disbelief or in disappointment... How did my friend like it? She was stunned, fascinated. but she professed not to understand much of the play's inner meaning. How did she know that it had a deeper meaning? Oh, of that she was sure. 'Aren't we all waiting for Godot,' she said, 'whoever or whatever that might be? I found it funny and sad at the same time. Isn't it maybe about how often useless it is to hope? And yet they come back night after night, which means they haven't entirely given up hope? ... Didn't you have the feeling that Vladimir and Estragon had been waiting not just for those two days but FOREVER? ... 'You didn't live through the war here,' she went on, 'but you tell me Mr Beckett did. I doubt he could have written this play if he had not suffered the German occupation.' Why? I asked. 'Well one reading might be - and I'm obviously wrong - that Pozzo is the Germans and Lucky is us the French, don't you think? They too had a leash around our neck, they beat us and killed us for no reason at all, they made us sing and dance to their tune, were as cruel and senseless as Pozzo is. Then, in the second act, Pozzo is laid low, blinded, just as the Germans were in 1945 and later. Just a thought. I'm being far too literal, I know, for this play's universal. I'd like to know what you think?' (1 - p.162). I was running the Arts Theatre in Great Newport Street. ... I went into my little cupboard office and found a script which said "WAITING FOR GODOT by Samuel Beckett'" and a letter from Donald Albery, who was a West End impresario. It said, 'I don't know whether you know this play: it's on in Paris in a seventy-five-seat theatre, and it's been on for some time; it's very highly regarded. No one will do it in the West End, no director will touch it (Peter Brook had turned it down, for instance), and every actor has turned it down. I've seen some of your work, at the Arts theatre, and I liked it, so I wonder whether you would like to do it.' So with a sense that I was certainly at the very end of a queue, I looked at it. I'd vaguely heard of Beckett; I hadn't read a word of him; I hadn't seen the play in Paris, but I'd heard of it. And I read it. I won't say that I said to myself: this is the major play of the mid-century and it's a turning point in drama, but I did find it startlingly original. First of all that it turned waiting into something dramatic. Second, that waiting becomes a metaphor for living. What are we actually living for, what are we waiting for, will something come, will Godot come, will something come to explain why we're here and what we're doing. And I found it terribly funny, and I also found it genuine, poetic drama. ... The cast was Peter Woodthorpe, Paul Daneman, Peter Bull and Timothy Bateson. ... "the play opened in late August or September (actually the 3rd August) in 1955. The first night was full of cheers and counter cheers.When Estragon said: 'Nothing happens, nobody comes, nobody goes, it's awful", an English voice said, 'Hear, hear!' ... They were absolutely baffled, a lot of them, but half the people said: this is it, this is what we have been waiting for. And the press was equally divided. ... on the level of what it brought to theatre, I think it nailed the colours again to the old mast of theatre: that theatre is a place of imagination and of metaphor and of contradiction. It is the Shakespeare mast to me. It also says that there is no active theatre without the tension between the form of the writing, the form of the creation, and the emotion that the actor is trying to express. Whether it's Shakespeare's iambic pentameters or whether it's Beckett's very precise, beautiful cadenced prose, it has a rhythm and an actuality. I would advance the theory that GODOT is the masterpiece of the mid-century, certainly way, way way more important than (Osborne's) LOOK BACK IN ANGER. (Harold Pinter agreed: Osborne merely stirred things up - didn't really change anything, simply touching the nerve endings of the complacent theatre world and society.) And GODOT is still there now as a great play and will remain so because it has metaphorical richness which makes one think of Shakespeare. If you want to think of GODOT as a play about politics, it's there. If you want to think GODOT as a play about relations, intimate relations between man and woman, or man and man, or friend and friend like an early version of WHO'S AFRAID OF VIRGINIA WOOLF?, it's there." It emancipated a whole generation from naturalism: "I don't think Harold (Pinter) - or Tom (Stoppard) - would have written the way they did write- -or at all, had it not been for Beckett." (2-p.47-48). Now, come down to Australia: The first production was at the Arrow Theatre in Melbourne in September, 1957 with Barry Humphries as Estragon and Peter O'Shaughnessy as Vladimir (1957 - someone's finger on the international pulse of theatre adventuring! ), it toured to the Sydney Independent Theatre in May, 1958. I have seen many productions both professional and amateur - universities, love it - one set, five actors, just as Delphine Seyrig predicted, it's likely to be done, as it is so inexpensive to mount - a tree and a rock! - as is the other inexpensive perennial favourite, THE MAIDS. (I played Pozzo, in 1965, when 17 at Alexander Mackie Teachers College! - we had no idea what we were doing, I had no idea what I was doing, for sure! - a precocious and, definitely, naive Catholic school boy). Mel Gibson as Estragon with Geoffrey Rush as Vladimir, John Clayton as Pozzo and Robert Menzies as Lucky, for NIDA Jane St, in 1979, directed by George Whaley. John Gaden and Max Cullen directed by Neil Armfield at Belvoir. Ian McKellen and Roger Rees at the Sydney Opera House in 2011, and now Richard Roxburgh as Estragon and Hugo Weaving as Vladimir. One way or another there are those of us sitting in the Sydney Theatre, who have, been in the play, directed the play or, at least, seen this play many, many times before, and so bring some insight/prejudices to it, and others who are experiencing it for a first time, accompanied with all of its illustrious history, or not. There are those of us who have seen it in intimate venues such as the tiny Jane St Theatre in Randwick, and now in this, relatively huge venue - no real intimacy here - the scale dimensions of the Sydney Theatre (896 seats) a long way from the Parisian Theatre de Babylone (75 seats!) or the Arts Theatre of London, some sixty years ago. Certainly, on the night I attended this production by Andrew Upton, the audience, mostly, had a rollicking time, and applauded generously. Whether they found the play sad, insightful and/or metaphorical as well, I was not able to ascertain. To some I hope. To some, I hope it was more than the comic skill and acting finesse of this fine company that rewarded the production, for indeed, the acting by this company was of a very impressive standard. 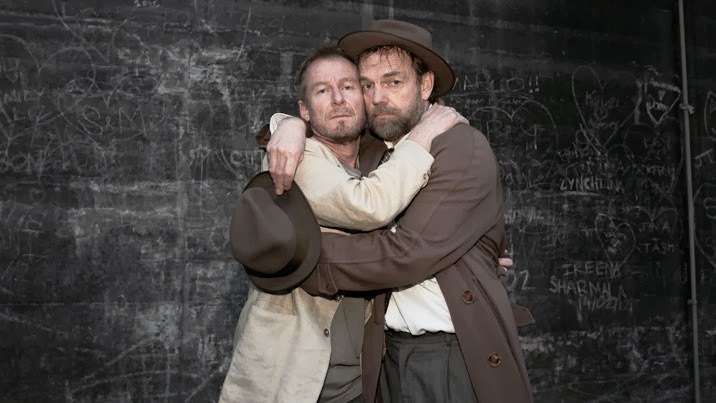 Five wonderful ensemble performances, Richard Roxburgh (Estragon), Hugo Weaving (Valdimir), Philip Quast (Pozzo), Luke Mullins (Lucky) and on my night, young Otis Pavlovic (Boy), the sensibilities between them was palpable. The comic rapport between Mr Roxburgh and Weaving was the source of much of the laughter in this production, often extended to the exhaustion of audience response - the physical 'clowning' garnishes, maybe, sometimes, overwhelming the textual core of the work. The physical invention sometimes appearing to be the object of the playing in this material, directed by Mr Upton. (breaking out of the fourth wall, over the stage edge of the proscenium, seemed to be a deliberate crowd pleasing choice - it had little other logic). Mr Weaving sounded as if he were giving a too reverential,"classical" approach to Vladimir - stately, weighty, with a heightened sonority, that placed the character, aurally, into a kind of aspic jelly - of a character we have met many times before. This was in contrast to the delightful irreverence that the more lively and plastic, and seemingly, spontaneous effects of Mr Roxburgh's performance were making. He seemed to be genuinely moving towards a more personal realisation of the inner mechanisms of Estragon - it had more of a contemporaneous investigation of the possibilities of creating the character anew. It was, for me, an Australian 'nose-snook' at the usual received performances of this character - it felt fresh and challenging, no museum feel at all. Mr Mullins as Lucky, tops a year of wonderful offers of stagecraft and invention in Sydney this year: LITTLE MERCY, ANGELS IN AMERICA, SMALL AND TIRED. His creative invention and absolutely non-stop twitches of life result in an arresting but overactive performance. Seated in the circle, looking down onto the stage, Mr Mullins was constantly drawing attention to his presence - I wondered if, for the sake of the clarity of the text, if a little less invention would have been better. Mr Quast made an impactful entrance as Pozzo but unlike Mr Mullins seemed to disappear in stage effect over the night, while Mr Pavlovic gave his two short scenes with streamlined innocence, and was genuinely impressive as a result. Originally Tamas Asher was to direct this production, but was not able to fulfil the engagement, and what we see at the Sydney Theatre is a play written by an Irishman in France (the play was originally written in French and was re-worked in English by Beckett, himself) in a production conceived by two Hungarians - including the Set Designer, Zsolt Khell - directed by an Australian, Andrew Upton, assisted by Mr Asher's Hungarian assistant, now Mr Upton's Assistant, Anna Lengyel, with an Australian cast. Indeed, a multi-cultural product. The very imposing Set Design of a slewed and ruined, red theatre proscenium arch, lined with small dead light globes, set against the theatre's actual arch; an ashen grey, moon-like tessellated floor, with black full and half walls holding ruined water heaters and broken electrical boxes, dominated by a dead looking tree with branch (that latterly sprouts green leaves) and a large scattering of blackened narrow tree stumps, plus a box-like rock, had no clear architectural logic or metaphorical statement for me, and certainly resonated as a middle-European cultural look, at odds with an Australian response to this play, expected by me, from the Sydney Theatre Company. The simple stage directions from Mr Beckett for the play's setting seemed to be entirely, unnecessarily, superseded. Mr Beckett was often very unhappy with the productions of his plays. Of the later German (Berlin) production, which had good reviews, Beckett said "I wish I hadn't gone ... the direction was all wrong." and though he added, "If the Germans had listened to me they'd have emptied the theatre far faster, I can assure you.". ... Within a few short years later, (he) would become deeply engaged in the details of each production, attend the rehearsals of virtually all his plays, often in essence becoming the director, and who in subsequently printed editions would indicate minute detail the stage directions to be followed meticulously." !!! - (1. p.210). I wonder what Beckett would have made of this set design. The lighting Design by Nick Schlieper, the spare Sound Design by Max Lyandvert and the Costuming by Alice Babidge were an asset to the instructions and intentions of the textual demands. This is a very entertaining production of an undoubted important and influential play coming from the middle of the last century. It is a great play, that may need a performance rest. Academically, of interest, kinetically worn out? Each of us have our response to a performance, and I hope this production of Samuel Beckett's masterpiece, WAITING FOR GODOT at the STC, gave some of its audience this perception of the power of theatre: "a connection to belief" - so eloquently expressed by Mr Blakemore in his new book: STAGE BLOOD. A recommended read for Christmas, for all theatre goers. THE TENDER HOUR OF TWILIGHT, by Richard Seaver, 2012, Farrar, Straus and Giroux, New York,. STAGE BLOOD Five tempestuous Years in the Early Life of the National Theatre, by Michael Blakemore, 2013, Faber and Faber. Companion to Theatre in Australia - Philip Parsons, General Editor. Currency Press - 1995. A very unusually informative program presented by the Sydney Theatre Company = $10.00.